Net Neutrality is worth fighting for. It is absurd that we have to keep fighting for this. Constantly fighting for this, but today several websites have gone offline in order to “break the internet” to fight for Net Neutrality. Net Neutrality is the belief that all traffic on the internet should be treated equally regardless of source or destination. This means that if Comcast wants to have more subscribers to their Netflix competitor, they need to build a superior product to Netflix and not throttle the connection to Netflix and force their customers to use their service instead. One of the big failings in the US is that over 50% of the country only has access to only one service provider when it comes to home internet. I, for example, live in a major city, yet only have access to Time Warner, the other 3 providers in the city currently have no offerings in my neighborhood. Without net neutrality, companies can throttle connections to sites they do not like unless they pay big bucks to be in the fast lane. This stifles innovation and growth. This prevents some small bookstore owner from creating an Amazon killer. This would lay waste to the SEO industry. Anyway, instead of rehashing why all this matters like a million other websites have, just read this neat primer, and then call your congressmen and fight for Net Neutrality. TechBloc has another event this month, this time with a special guest speaker. House representative Will Hurd. The event was held at Paramore, a trendy bar in downtown San Antonio, just south of the Pearl. The bar is nice, a bit pricey, but it does come with some spectacular views, like this one of the San Antonio Art Museum. Rep. Will Hurd attended the event last evening and spoke to us about San Antonio’s impact on the Tech scene. In particular, he mentioned that San Antonio is a cybersecurity capital and leading the way in efforts to protect sensitive data. A particular thing that struck a cord with me is his support for Apple, in the ongoing FBI vs Apple case. Hurd spoke eloquently about the case and defended the rights of Apple to not have to break their own encryption or build a special tool on behalf of the FBI and his stance against it. Seemed to be a bit preaching to the choir to make the announcement at this particular event, but it was still reassuring to hear him speak on the topic. Last evening I went to visit a friend of mine at the bar. She is starting to build her own blog on WordPress, and wanted to chat with me about her site and how it is organized and show me her first couple of original blog posts. I immediately became excited for her and the journey she was about to step out on. Over the years I have helped numerous friends start their blogs, make web sites and tell their stories, however I have not done a very good job of cultivating that about myself or on my own site. In fact, the whole reason I joined Pdexposures was to help Nate and Tony launch their site. From that launch we built up a very successful podcast with an amazing audience of fans. The start of this, was a simple tweet to Nate, one of my co-hosts. I knew that he and Tony had recorded an episode but they were trying to figure out how to host it. I tweeted at him that I knew how to upload the audio into WordPress and how to generate the RSS feed to create the podcast and submit it to iTunes. By helping to promote them, they asked me to participate in the show, which was a joy to work on. Last night while sitting at the bar, reading her blog posts and helping her plan what she wanted to do, I had a moment to reflect on how much I enjoy helping others to build things. Big ridiculous things that can help improve everyones day of life. Helping others can teach you two very important lessons. When I began this project with Nate and Tony, I knew the rudimentary mechanics of installing a podcast into WordPress. What I didn’t know was how to setup the site to handle multiple feeds so multiple shows could exist on the same site. Additionally, I learned more on the SEO of a podcast and how to promote it best to get a great audience. The biggest lesson learned was, “I am bigger than I think I am.” Over the course of the show we had multiple guests. Including a representative from Impossible Project, and Lomography’s CEO. Big names in the film photography space sent their representatives to help grow our little site. Success is a strange thing. How do you define it? What is each individuals definition for success? Is it 100 Facebook fans? 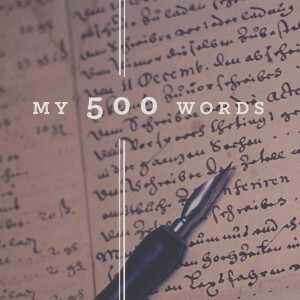 500 blog readers? Helping others succeed shows you the steps to a great goal, and how to get there and every milestone hit, only introduces a new milestone that can help along the way. What have you helped others build?